Call for New Directors! At a recent Board meeting it was agreed to look for some more volunteers to help the community company as we have vacancies! Meetings are about every 6 weeks, and as you can see there are lots of projects to get involved in if you want. Normally the company AGM is held in May, but the Board has agreed to hold it in October to allow time for our ever-more-complicated accounts to be finalised. If you are interested in joining the Board, or even coming along to a meeting to see what goes on then drop us a line! Sunart Paths Network have now set two dates for working group days 12th May, and 2nd June all from 10am – 1pm (come for as long as you like). Spades at the ready! If you’re interested in helping, get in touch with Izzy for more details. 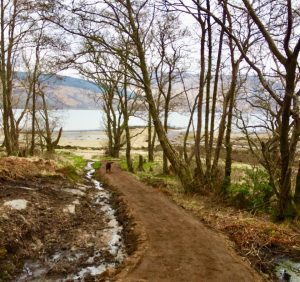 The Path to Ardnastang Beach is now open! A huge thank you to Murdo Campbell for volunteering his time and machinery, Thomas, Aiden and Robert for their hard work. The Longrigg Burn path is also now open! Thank you to our team of enthusiastic volunteers and their edible treats! The path runs from the Ben View carpark up the side of the burn and comes out further up Longrigg Road. It’s a beautiful spot! Our next Paths Meeting is 15th May, where we will be planning our next projects. Let Izzy know if you would like to be on the mailing list for updates or to attend – ALL WELCOME. 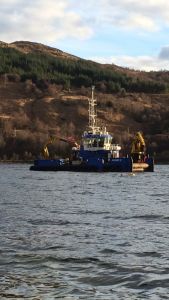 Three Visitor Moorings were installed on Easter Sunday by Mallaig Marine at the Strontian Jetty. We are organising some donation boxes for users’ contributions towards their upkeep. 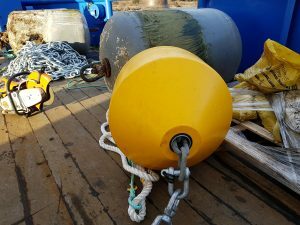 With Tobermory and Salen becoming busier in the summer months, this is a trial to see if we can encourage more visiting yachts, now that crews know there are secure moorings for them at the head of the loch. Meanwhile we still have spare ‘spaces’ for local boat owners who want to lay their own moorings so if you want one, please contact Izzy. For those of you with moorings, invoices will be out shortly! Sunart Men’s Shed are getting up and running, with the interior repainted, skirting boards on but the electrical wiring still to do. Workbenches will be installed in the next few weeks. They would be very grateful for any donations of hand tools or power tools. Let John Tyldsley or Izzy know. The company has now formally submitted a Registration Application to Scottish Ministers for a ‘community right to buy’ the former Visitor Information Centre, with 106 signatures being collected in support of the idea. Eight local businesses have expressed an interest in operating from the unit with the majority interested in working collaboratively to sell their products from the shop, which of course fits with one of the company’s aims of supporting local employment. Meanwhile our persistence with Visit Scotland paid off, and they have helpfully arranged access to the property for SMMAATA to display their new visitor information maps in the windows. This supplements the excellent visitor information being supplied voluntarily by Mandy and her team at the Woodland Pottery. Sunart Community Company is a charity based in Strontian. Our role is to support the empowerment, sustainability and development of the local community.